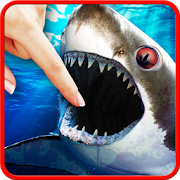 Shark smasher is a great, free game. You will find beautiful graphics inside it, with many wonderful backgrounds in both day and night versions. Awesome 3D sharks and obstacles: fish, sea turtle, seahorse, jellyfish, naval mines and octopus. Take the challenge and save the fisherman from sharks’ attack. Pass all 32 levels! Shark smasher will be enjoyed by people of all ages. Beware, this game is addictive!How to play? It’s very easy:- click on sharks to get rid of them,- avoid fish, sea turtle, seahorse and jellyfish – touching them will cost you 1 life,- beware of naval mines and octopus – touching them will cost you all lives,- click on a shell with a pearl – you will get an additional life,- do not let the sharks come close to the boat with fisherman,- try to get as many points as possible ,In case of any problems with the effect of Shark smasher, instead of giving us the negative opinion, please send us an e-mail and review briefly the problem. It will help us to solve it in the next updates of game with sharks attack.Shark smasher is free but contains ads. Revenue from advertising will help us to create new attractive game, wallpapers and applications. All permissions are required only for advertising and are supported by trusted vendors.